Report: How do Kansas City stadiums rank for food safety? Kansas City’s professional sports stadiums rank in the middle nationally when it comes to food safety, according to a report. KANSAS CITY, Mo. — Kansas City’s professional sports stadiums rank near the middle nationally when it comes to food safety, according to a report. ESPN’s Outside the Lines reviewed food-safety reports at 111 professional sports venues across the country and ranked the stadiums from best to worst. Kauffman Stadium and Arrowhead Stadium ranked 63rd and 68th, respectively. At Arrowhead, about 46 percent of the outlets inspected had high-level violations, the report found. In August 2017, inspectors found dead bugs between coolers at a barbecue stand. In another case, open boxes of raw chicken were seen sitting above guacamole in a cooler in September 2016. At Kauffman Stadium, inspectors saw a bartender using bare hands to handle a lime at Crafts & Drafts in April 2017, and bug carcasses were found beneath a sink at a concession stand in August 2017. Out of Kauffman’s 106 food outlets, 44 were found to have high-level violations, according to the report. Overall, the report found that 28 percent of professional sports venues had high-level violations at half or more of the food outlets inspected in 2016 and 2017. High-level violations were considered those that pose a potential threat for foodborne illness, according to the report. 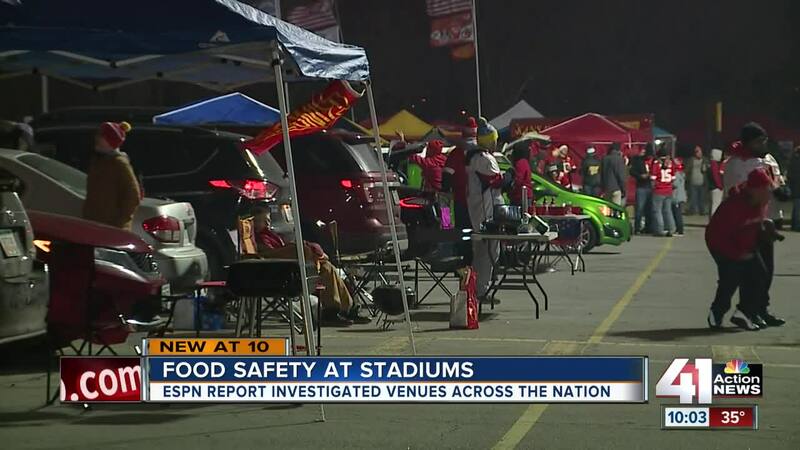 The findings of the ESPN report brought nasty feelings for some Chiefs fans who tailgated outside Arrowhead Stadium on Thursday evening. Others found no concern after reading and hearing about the high level violations. Food inspections at Kauffman Stadium and Arrowhead Stadium are handled by the KCMO Health Department. Senior Public Health Manager Naser Jouhari told 41 Action News that around one to two inspections happen every year at the sports venues. While some may find the details of the ESPN report sickening, Jouhari said it was quite common to find violations at any establishment that serves food. In St. Louis, Busch Stadium and Enterprise Center ranked 34th and 45th, respectively. Read the full ESPN report here .